Lora Alexander is a color analyst who specializes in make-up artistry. She blogs about color at Pretty Your World. Here she shares her story on using Munsell to get back to basics and learn a more robust system for analyzing color. As soon as I read Carole Jackson’s book “Color Me Beautiful” back in High School I was hooked. I became obsessed with analyzing everyone’s “season”, whether in person or on TV. It would be quite a few years before I turned my passion into a successful website. But I continued to color analyze anyone and everyone in the meantime. The 4 season system of the book worked for me. My red hair, pale ivory skin and green eyes put me perfectly into the “Autumn” category. I thought it was a perfect system. It did indeed work for some; but not everyone. After studying color theory more, it was found that the system was indeed using two of the 3 characteristics that Albert Munsell talked about: Hue and Value. But something was missing and that was Chroma. Once this element was put into the equation, the 4 seasons expanded into 12. And a newly advanced color analysis system was created. This was the system I was trained on years ago and was using until about a year ago. The system worked for most, but there were still some people who didn’t fit neatly into the 12 seasons. For example, there were some Winters who clearly had the depth and other characteristics of a Winter (like the color black looking great on them, for example) but the overall clarity and high contrast of the typical Winter seemed too sharp and unflattering. Their chroma was muted, not clear. But a muted Winter? It didn’t make sense. 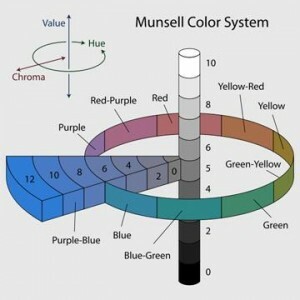 This is where someone went back to the basics and studied Munsell’s system even further and created an even more advanced color system based on his principles, called the 4×4 Color System®. That someone was Certified Image Professional Consultant Ferial Youakim, AICI CIP. Ferial found that there were some gray areas in the 12-season system. Literally! What was missing was the element of gray. Most people are probably familiar with the terms tints, tones and shades, perhaps first hearing about them in art class. A tint is a color that has white added to it. A tone is a color that has gray added to it. And a shade is a color that has black added to it. What Ferial discovered was that the 12-season system was missing this Tone element. Note: Ferial’s discovery didn’t change or alter the existing 12 seasons, other than help understand it better. It did however add one more season to each of the four main seasons. PURE, TINTED, TONED or SHADED SEASON. 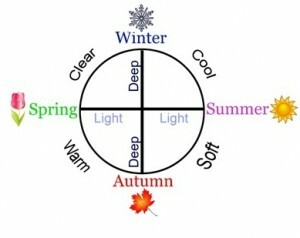 The image below shows 4 Winters and how different characteristics might show up in a person. Note that the Toned Winter (3rd photo) is a new season that 4×4 Color System identified, the type of person I described above: someone having the depth of a Winter but who’s chroma is more muted than clear. And here’s some celebrity Winters who illustrate the Pure, Tinted, Toned and Shaded concept: Megan Fox, Alison Brie, Katie Holmes and Kim Kardashian, respectively. The differences can be very subtle. But to the person who is trying to find their absolute perfect look, knowing their correct season is like when you fine tune an image with binoculars; it might look ok until you adjust things just so and everything is in beautiful focus.